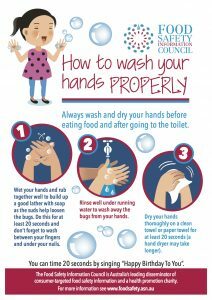 A Food Safety Information Council survey found that most people don’t have the correct hand washing technique and an amazing 9 per cent of women and 27 per cent of men didn’t wash their hands at all when observed in a shopping centre washroom. A similar result has been found in US studies and may mean that we are getting complacent about good hand hygiene in western countries. 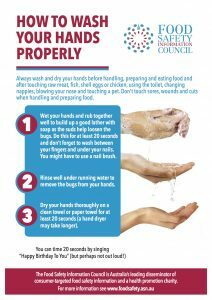 You might find with correct hand washing that you and your family may not only get less food poisoning but also less viral diseases like colds and flu. In the US, a study found that school children had fewer days off school sick once they had instituted a hand washing program. Everything you touch is capable of transferring bugs onto your hands, but things like sores, pets, used handkerchiefs and tissues and the things you touch when you go to the toilet can be especially dirty. Dry your hands thoroughly on a clean towel for at least 20 seconds. Touching surfaces with moist hands encourages bugs to spread from the surface to your hands. You can time 20 seconds by singing ‘happy birthday to you’ this is also a good way to encourage your children to wash their hands for the correct period. Do not touch sores, wounds and cuts when handling and preparing food. Cross contamination occurs when bacteria and viruses are transferred from a contaminated food or surface such as a chopping board and utensils to other food. For example, it can happen when bacteria from the surface of raw meat, poultry, seafood and raw vegetables (such as unwashed potatoes and other root vegetables), are transferred onto ready to eat foods, such as leaf and vegetable salads, rice or pasta salads, cooked meats, poultry, seafood or even fruit. The bacteria on the raw food are killed when the food is cooked, but the ready to eat food is eaten without further cooking – bacteria, viruses and all. Hands are among the obvious culprits in transferring bacteria and viruses from raw to ready to eat food, but direct contact with soiled raw foods, dirty chopping boards, knives and other food preparation implements and containers can also spread the contamination. Chopping boards, plates and knives, blenders, mixers, bowls, or any other surface that has been in contact with raw meats, seafood and soiled vegetables and herbs needs to be carefully washed with warm water and detergent, then rinsed and thoroughly dried before being used for ready to eat foods. Sponges, brushes, and dish cloths can harbour bacteria, especially if kept damp so try to dry them out after use and they can be kept clean by soaking in bleach solution. Also sponges can be heated in the microwave, brushes put in the dishwasher and cloths in the washing machine.You should clean up risky contamination like raw meat and poultry juices or egg using paper towel, which you can then discard, and wash hands afterwards. Cross contamination can also occur from incorrectly storing raw food in the fridge. If raw food is placed in direct contact with ready to eat foods, or if raw meat juices drip onto cooked foods, fruit and other ready to eat food, cross contamination can occur. Raw foods should always be treated as though they are contaminated. Raw food, such as meat, poultry or seafood, should be stored in a rigid leak proof container or at the bottom of the fridge to prevent it coming into direct contact with ready to eat food or to prevent meat juices or liquids dripping onto other food. Ready to eat food should be stored covered in the fridge to further reduce the risks. In the home it really doesn’t matter whether you have wooden, plastic or glass chopping boards so long as they are kept really clean and in good condition. The porous nature of wood makes it advisable to use plastic or glass chopping boards for raw meat, poultry and seafood. It is easier if you have two boards – one used only for raw food and one for cooked and ready to eat food or bread – to prevent cross contamination. All chopping boards should be scrubbed with hot water and detergent and dried after preparing raw foods. Plastic chopping boards are good as they can be washed at high water temperatures in the dishwasher. All plastic and wooden cutting boards wear out over time. Once cutting boards become excessively worn or develop hard-to-clean grooves, they should be discarded. According to recent research, most Australians don’t know that cold food should be stored at or below 5°C. Yet doing this can considerably reduce the chances of you or your family getting food poisoning. Storing perishable foods and food ingredients in the fridge or freezer is primarily to prevent food poisoning or to slow down spoilage and loss of food quality. 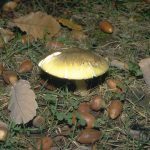 At 5°C or colder and at freezing temperatures many bacteria that cause food poisoning and food spoilage either don’t grow or their growth may be slowed down. Remember though that there is a limit to how long food can be refrigerated as it will eventually spoil and the quality deteriorate and some food poisoning bacteria such as Listeria monocytogenes can grow and cause infection (see Advice on Listeria). Frozen food can be kept safely for longer although quality may deteriorate. To check if your fridge is operating at the correct temperature you need to purchase a thermometer and place it in the fridge. When you do this you might get some surprises. The temperature inside your fridge will vary several degrees as the fridge goes through its cycle. It will also vary markedly from one section to another. The door is usually the warmest part and the top shelf is often the warmest shelf. We suggest you place your thermometer below the top shelf and towards the door to give a general indication of the fridge temperature. If the thermometer shows your fridge is higher than five degrees, adjust the fridge setting to lower the temperature. The crispers for fruit and vegetables will usually be slightly warmer so that the fruit and vegetables don’t freeze. You might have to adjust the fridge a few times to get it right, but ideally, you want the main compartment to spend most of its time around 4 to 5°C. Check that food looks and feels frozen to be sure your freezer is functioning correctly or use a thermometer if you have one covering this range. Partially frozen food will have a shorter shelf life. If you have a lot of food in the fridge, for a party or some other function, remove the drinks, pickles and jams to make more room. These foods can be left out of the fridge for a while. Good air circulation between items in the fridge is important to keep them cold. Store ready to eat food (i.e. food that is eaten raw or will not receive any further cooking like a dessert, salad) above raw food. Store raw meats, seafood and poultry where it is coldest. In many fridges this is the bottom shelf. Wherever you store raw meats,poultry and seafood, make sure that juices and liquids can’t drip onto other foods. These juices might contain food poisoning bacteria which can contaminate other food if they drip onto it. If you have to store raw meats or poultry on higher shelves, put them in leak-proof, sealed or covered containers. Avoid raw foods touching cooked foods and keep them separated in the fridge. Cover any cooked or ready-to-eat foods stored in the fridge to reduce the risk of cross contamination. For large quantities of food divide it up among several shallow containers so it cools faster. Cool food on the bench only until steam stops rising. Then place the hot food directly into the containers, cover with a lid and put them in the fridge. When freezing food, avoid freezing large amounts at a time. It’s better to split it into smaller quantities in separate containers. This also means you can defrost only the quantity you need. When freezing food you’ve just bought, place it in freezer bags to maintain quality. You don’t need to unwrap pre-packaged raw meat on trays, just put it in a freezer bag. This will help minimise cross contamination in your kitchen. Tie the bag after squeezing out as much air as possible, label and date. If you are freezing cooked food or leftovers, the most important thing is to cool it quickly. Cool food on the bench only until it stops steaming. Then place the hot food directly into the container, cover with a lid and put it in the freezer. When there is a power outage you need to take extra measures to reduce the risk of food-related illness. It is important to record the time the power went off. When a power cut is ongoing (that is, it lasts for more than 4 hours and there is no immediate likelihood of reconnection) food safety becomes an important issue. if you don’t have a fridge thermometer and another cold storage area is not immediately available after 2 hours. There are some clues when your fridge is having trouble coping. If the motor stays on most of the time, or if your milk, cottage cheese, meat (particularly mince meat) or other perishables are going off quicker than they should, then this is a sign that your fridge is struggling and needs maintenance and/or adjustment. Whole pieces of meat, such as steak, beef, pork and lamb, can be cooked to taste (rare, medium-rare and well done) as long as the outside of the meat is fully cooked to kill external bacteria. Meats that are mechanically tenderized, marinated and moisture enhanced are an exception as bacteria can be introduced into the meat during the processing and they should be treated as stuffed, rolled or minced meats. Always cook chicken, rolled and stuffed meats, tenderized, marinated and moisture enhanced meats, sausages and minced meat, such as hamburger patties and sausages, so that in the centre of the thickest part the temperature reaches 75°C. 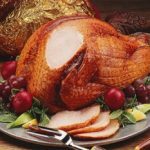 This is because food poisoning bacteria can be present all the way through these types of meat products as well as on the surface and only thorough cooking will kill them. 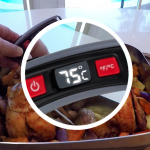 To check whether these foods have been sufficiently cooked to 75°C you need to use a meat thermometer. Meat thermometers are available from good kitchen shops and some electrical stores ranging in price from between $12 to $40 or more. In the upper price range, digital thermometers can be easier to read and those with fine sensitive tips can be more accurate. Using a thermometer to test when food is cooked not only ensures safe food, it also avoids guessing and ensures you cook your food to perfection every time. To test the temperature the thermometer probe should be inserted in the thickest part of the meat, such as the thigh on poultry, not touching bone or gristle which can give a false reading. Poultry, sausages, hamburgers, tenderized, marinated and moisture enhanced meats and rolled roast meat should reach an internal temperature of 75°C to ensure all food poisoning bacteria are killed. This should be inserted into the meat before it is placed in the oven or cooked, with the dial facing forward so it can easily be read. The probe is placed in the meat and the wire run between the oven door seals to the digital read out which sits outside the oven. Always carefully read the instructions before using a meat thermometer. Meat thermometer probes should be thoroughly cleaned each time they are used to check the temperature while cooking so as not to transfer contamination, after use and before storage. Strict food safety standards apply to food retailers in Australia to ensure that the food you buy is safe. But there are some signs you can look for to ensure you buy a safe product. Once you buy the food, it’s up to you to make sure that it stays safe including not leaving shopping in a hot car. Choose a clean trolley or basket for your shopping. If you don’t think any of those available are up to standard talk to the store manager. Never put fresh fruit and vegetables you won’t peel or cook before eating directly into the trolley. Put them in a clean bag. Re-usable shopping bags can be a source of contamination. If you use your own shopping bags make sure you regularly wash them. Use separate, leak-proof, easily washable bags for meat/poultry/seafood and for fruit and vegetables. Insulated bags or coolers should be used to carry food such as meat and dairy products that require refrigeration. Save money and lower your food safety risk by planning ahead and making a shopping list. If you buy perishable goods in bulk make sure you have room at home to freeze what you don’t use immediately. Damaged food packaging can provide an entry for bacteria. For example, check cans for unusual swelling and/or leakage, broken tamper seals, rusty or severely dented cans, and damaged seams. Do not purchase the food if you see any signs of defects. Don’t buy food that has mould growth visible unless it is supposed to be there such as on some cheeses and cured products. If in doubt ask the shop keeper for advice. ‘Use by’ dates are dates marked on foods to advise shoppers that the food must be eaten before the marked date for safety reasons. Foods marked with a use by date cannot legally be sold after the date marked. Eating foods after the use by date is at your own food safety risk. ‘Best before’ dates refer to the quality of the food. They are marked on foods which do not present food safety issues, but if these foods are eaten after the best before date they may have lost nutritional value and quality. Foods can be sold after the best before date marked provided the food is fit for human consumption. The only food that can have a different date mark on it is bread, which can be labelled with a ‘baked on’ or ‘baked for’ date if its shelf life is less than seven days. Foods that have a shelf life of two years or longer, for example canned food, do not need to be labelled with a ‘best before’ date. This is because it is difficult to give the consumer an accurate guide as to how long these foods will keep, as they will retain their quality for many years and are likely to be consumed well before they spoil. Check marked down food with use by dates to be sure it is within that date. If you cannot read the date marks or if they are covered by a sticker, for example a price mark down sticker, then ask the shop keeper for the date or find a package with clearly visible markings. Remember if you freeze food that has a use by date you should use it straight away after thawing as the use by date marked will no longer be relevant. Vulnerable people, such as pregnant women, the elderly, the very young and people with poor immune systems, are at risk of the illness listeriosis caused by Listeria in food and need to avoid certain foods such as soft cheeses and deli meats. Check high risk foods at www.foodsafety.asn.au. For allergy information see Allergy and Anaphylaxis Australia’s website . Shop for non-perishable food first – leave the chilled and frozen food until last. Keep hot foods separated from frozen and chilled products while shopping and during transport home. If a product is labelled as ‘ keep refrigerated’ or ‘keep chilled’ and is not in chilled storage, don’ t buy it and alert the store manager. Plan to do your food shopping last and take it straight home so perishable food is allowed to warm to temperatures in the danger zone (5° to 60°C) for as little time as possible. Chilled and frozen foods are best taken home in bags or boxes with insulation added to keep food cool and an ice brick can be included especially if you travel a long distance or expect a delay. Always go home with food purchases as soon as possible and don’t leave your shopping in a hot car. Avoid shops/markets where cooked or other ready-to-eat food (such as cooked seafood, cooked poultry or deli meats) can be seen in contact with raw products or where all these foods are served with the same utensils or are handled by the same shop assistant without changing gloves. Serious concerns should be reported to your State/Territory Health Department or local council. Keep raw meat, poultry or seafood separate from cooked and ready to eat foods. Ask the check-out operator to pack them in a separate, leak-proof bag (they can be packed in the same bag) and encourage them to pack chilled and frozen items together by placing these items together on the conveyor belt and by providing an insulated bag or cooler. When home, pack chilled and frozen products into your refrigerator or freezer immediately. If you receive home food deliveries make sure you are there to receive them and you put chilled and frozen products straight into the refrigerator or freezer. Alternatively arrange for these foods to be placed in a cooler with ice bricks in a shaded place that will keep your delivered food chilled until you arrive home. If you get home and then find some evidence of tampering or package damage that you didn’t notice when buying it or expect for online purchases, return the product to the store or call the manufacturer. Check labels for specific storage conditions to ensure safety and quality. Don’t assume that you know how to store food as recipes change and modern food products like jams or sauces may have less salt or sugar than in the past and may need refrigeration. The temperature range between 5°C and 60°C is known as Temperature Danger Zone. This is because in this zone food poisoning bacteria can grow to unsafe levels that can make you sick. Keep your fridge below 5°C. At these temperatures most food poisoning bacteria stop growing or they grow slowly. Use a fridge thermometer to check that the temperature stays around 4 to 5°C. Also make sure you have enough fridge space as fridges won’t work properly when they are overloaded or when food is packed tightly because the cold air cannot circulate. If you are running out of room in your fridge, remove foods that are not potentially hazardous, such as jams, pickles, vinegar-based dressings, bottled or canned drinks. The temperature of these foods is not critical for safety and they can be kept cool in insulated containers with ice or cold packs. Freshly cooked food, not for immediate consumption, should be cooled to below the danger zone as quickly as possible. Divide food into small shallo containers and place in the fridge or freezer as soon as it stops steaming. Hot food needs to be kept and served at 60°C or hotter. If you are keeping it warm for someone put it in the oven at 60°C or at 100°C if that is as low as your oven will go. Use the two-hour/four-hour guide below to work out what action you should take to avoid food poisoning if potentially hazardous food is held at temperatures in the danger zone. Plan ahead. Don’t over cater as the greater the quantity of food you prepare the harder it is to keep it hot or cool enough until it is served. If you are catering for a lot of people prepare food as closely as you can to the time you will serve it. Keep your fridge at or below 5°C. Use a fridge thermometer to check that the fridge temperature stays around 4 to 5°C. Also make sure you have enough room in the fridge because if the food is packed tightly the cold air cannot circulate. Check the storage instructions. Read the label on packaged food to see if it needs to be stored in the fridge or freezer, many unrefrigerated items may need to be refrigerated once opened. Keep hot food at or over 60°C. Hot food needs to be kept and served at 60°C or hotter. If you are keeping it warm for someone put it in the oven at 60°C (or at 100°C if that is as low as your oven will go). Divide food up to cool quickly. Freshly cooked food, not for immediate consumption, should have the temperature reduced as quickly as possible. 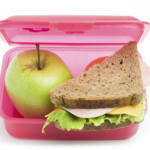 Divide the food into containers in small portions and put it into the fridge or freezer as soon as it stops steaming. You can cool food faster if you place the pot in a sink of cold water and stir it, replacing the water from time to time. Keep food on the move cool. If you are transporting perishable food around such as: refrigerated or frozen shopping, your (or your child’s) lunch or goodies for a BBQ or a picnic always use a cooler bag and add a frozen block or drink to keep things cool. If in doubt throw it out. If perishable food has been in the temperature danger zone for 2 to 4 hours consume it immediately. After 4 hours throw it out. Images courtesy of the NSW Food Authority.